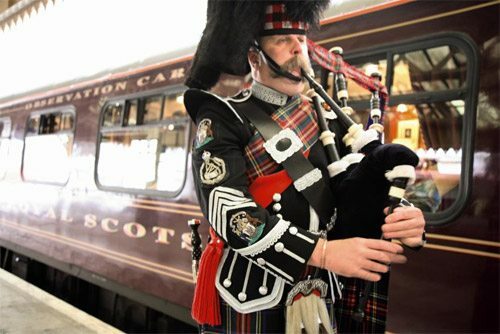 On the West Highland Line, one of the world’s most scenic rail journeys, the Belmond Royal Scotsman passes glens, lochs and mountains, steeped in the lore of giants such as Rob Roy McGregor and Bonnie Prince Charlie. Off train visits, such as to the spectacular, gothic Mount Stuart House, are included. Think of the finest country house on wheels, add in great food, conversation and sunsets over unforgettable landscapes, and you have a taste of the Royal Scotsman. The Belmond Royal Scotsman departs from Edinburgh early afternoon and heads west through Falkirk, Clydebank and Dumbarton to skirt Glasgow and so reach the northern bank of the Clyde. Near the mouth of the Clyde estuary lies Craigendoran, the starting point for the majestic West Highland Line. Enjoy afternoon tea as you travel along the edge of Gare Loch. Loch Long comes into sight to your left, and after vanishing for a while, returns with a view of Ben Arthur (The Cobbler) with its distinctive peak. Passing Arrochar you will get your first view of Loch Lomond. The train descends almost to the water’s edge at Ardlui, and then has a hard climb up Glen Falloch, whose many waterfalls provide an impressive display. 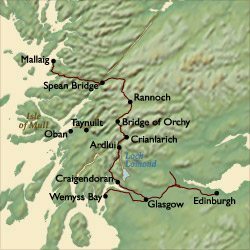 As you continue north you will pass through Crianlarich and Bridge of Orchy. There are spectacular views of Rannoch Moor before arrival in Spean Bridge where the train stables overnight. After a formal dinner (optional), you can enjoy entertainment in the observation car. Breakfast is served as your journey continues west, passing through Fort William with views of Ben Nevis (Britain’s highest mountain). Travelling by the side of Loch Eil you then travel to Glenfinnan Monument with Ray Owens, an historic storyteller. At the monument Ray will explain the history surrounding the area, followed by afternoon tea at Inverlochy Castle. Alternatively guests can choose to do the walk to Steall Waterfall with a mountain ranger. This is a moderate grade walk and requires guests to have good sturdy walking boots and waterproof clothing. The Steall Waterfall is the 2nd highest in the UK and is surrounded by some spectacular scenery. You then head to Lochailort, before turning north along this stunning coastline until reaching Arisaig. 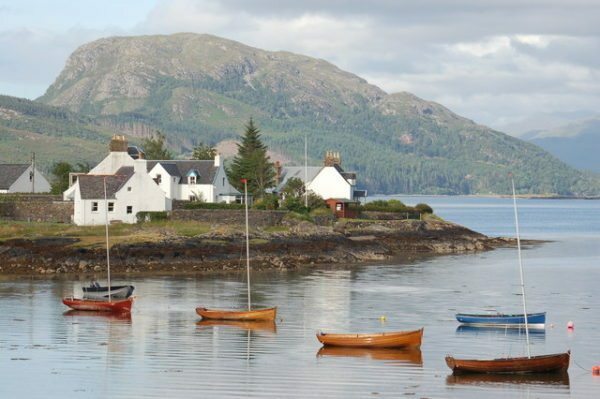 Here you can disembark for a romantic walk along the beautiful Morar Sands, a magnificent expanse of gleaming white sand, where you can enjoy excellent views across the Sound of Sleat to the beautiful Isle of Skye with its awe-inspiring Cuillin Mountains. Rejoining the train, your lunch is served as the train retraces the route towards Fort William. Here you will be guided around the town on an historical tour by a familiar face, giving you the perfect opportunity to admire and absorb the breathtaking local scenery and fascinating highland culture. After your guided tour you will return to the train and enjoy an informal dinner as you head south towards Bridge of Orchy where the train stables overnight. Leaving Bridge of Orchy this morning enjoy breakfast en route south towards Glasgow and Gourock. At Wemyss Bay, board the ferry across to the Isle of Bute. The island embraces a variety of landscapes; seashore, moorland, farmland and forest. The natural history, geography, geology and ancient history of the island are revealed at every turn. From St Blane’s Chapel at the south of the island to the abandoned townships in Glen More at the north, it seems that every stone has its tale to tell. Mount Stuart is Britain’s most spectacular Victorian Gothic house. This was the architectural fantasy of the 3rd Marquess of Bute and his architect Sir Robert Rowand Anderson. Stunning, mysterious interiors reflect the romantic and scholarly Marquess’ passion for art, heraldry, astrology, mythology and religion. At Mount Stuart, there is arguably the finest privately held collection of family portraits in Scotland. Following your afternoon tea, you will have time to explore this magnificent house, its tranquil Rock Garden, the Wee Garden containing rare plants from the southern hemisphere, the Kitchen Garden and the Victorian Pinetum. The Limetree Avenue leads you to a secluded stretch of coastline and one of the most beautiful beaches in Scotland. You return to the mainland and rejoin the train in Wemyss Bay where a formal dinner (optional) is served and the train stables for the night. You depart Wemyss Bay this morning and enjoy breakfast as you travel east towards Edinburgh where your memorable journey comes to an end. Originally launched in May 1985, the train, in its current form, dates from May 1990. 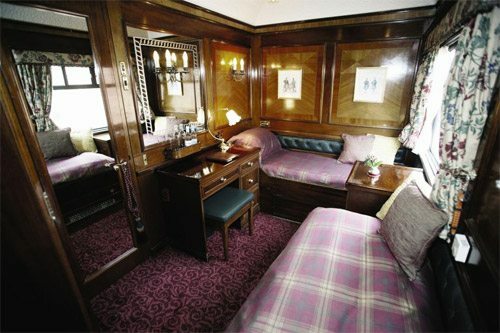 The owners put together a set of carriages (all rather different), which were rented in and called The Royal Scotsman, launching in the Spring of 1985. The carriage leases ran for five years and it was a success – the train won the Queen’s Award for Export. 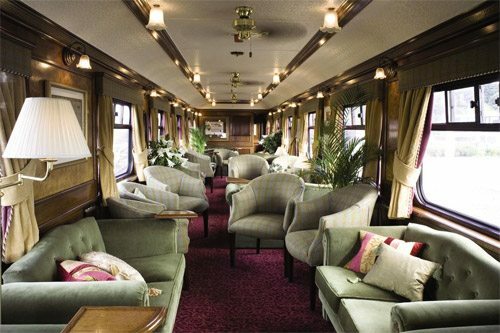 Owned by Belmond Hotels, Trains & Cruises and operated by The Great Scottish & Western Railway Company, today’s Royal Scotsman set is thus the second to carry its name. The running order of The Royal Scotsman carriages is: Observation Car with verandah viewing platform; Dining Car Number One (Raven); Dining Car Number Two (Victory); State Car number one, two, three, four and five; and a Service Car. The sequence is in running order from the rear so guests can best enjoy the passing countryside. All timings shown are for guidance only. Exact times will be supplied with your holiday documents.